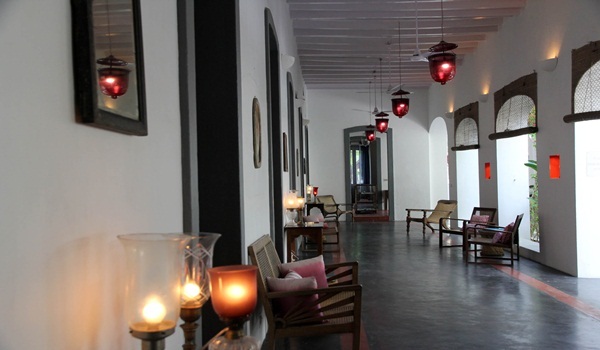 One of Pondya��s beloved villas gets a French restaurant and fancier rooms. IN a city of mustard, mango and ochre walls, the vivid teal blue villa at the corner of Rue Labourdonnais has been turning heads since summer. As I walk into the profusion of hibiscus, crotons and flowering trees that fill Villa Helenaa��s new al fresco restaurant, the bustle of Rue Bussya��where it opens ontoa��slowly slips away. a�?We wanted to be unique,a�? grins Benjamin Passicos, manager and partner, adding that the colour sets the tone for the distinctiveness that the property wants to embody in its new makeover completed in July. a�?Villa Helena is a heritage guesthouse with a contemporary vibe,a�? Passicos adds. The 19th century mansion served as a womena��s hospital, a teachera��s residence and an administrative office before it was turned into a bed and breakfast 15 years ago. Passicos, along with his partners, Geraldine Humeau and Caroline Vogelsang, took over five years ago, and initiated annual renovations which culminated in the total makeover this summer. Each of the seven rooms is decorated with a different colour scheme with complementing printed quilts, cushions and curtains. The bathrooms are easily among the most spacious you will find in a heritage property with alcoves for showers, panelled washbasins and floors dyed in earthy shades. But the rooms themselves have unpolished floors, stark white walls hung with a single foreboding portrait, vintage furniture including teak beds, weathered armchairs, wooden closets and writing desks. Devoid of televisions and other modern paraphernalia, Villa Helena is strictly for those who find the gold in the old. While the rooms open out into long corridors hung with charming lanterns, the two suites share a private pebbled courtyard. The blend of various cultural influences is evident not just in the restaurant which sprawls from a porch supported by stately white columns on one end to a bar under a tiled roof propped up by traditional wooden pillars on the other end. The menu too is a cultural mA�lange featuring couscous and hummus, paneer and pasta. But the new restaurant a��which is a reincarnation of the recently closed one at La Maison Rosea��is still recommended for its classic beef fillet and New York cheesecake. That 50 per cent of the menu is vegetarian may warm the cockles of many a tourist. As twilight falls, the courtyard with its white painted chairs under parasols, amps up its old world charm, with candles lighting up the place.